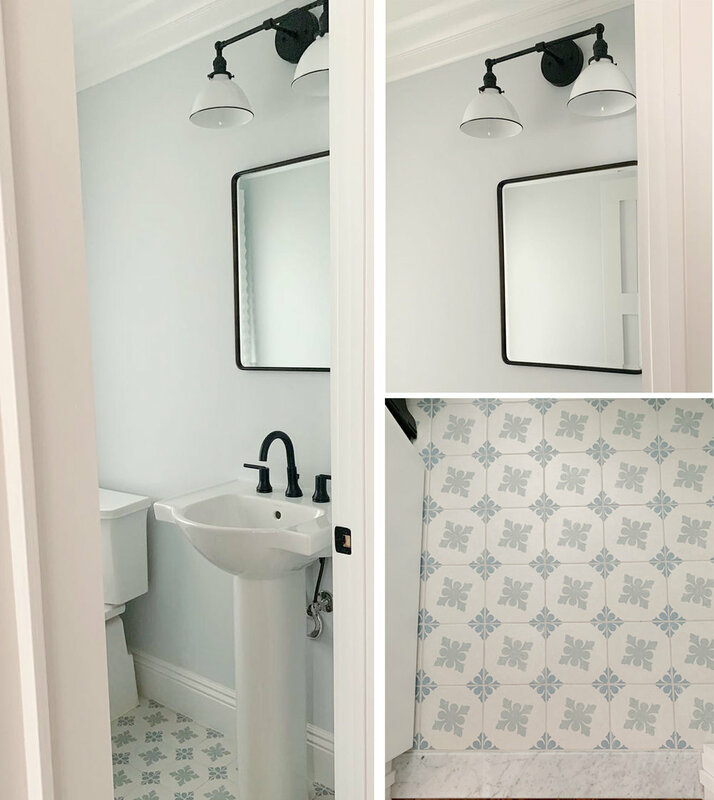 I am so excited to share this fun powder room that I’ve been working on for my client who is at the end of a 5 month renovation / addition. I don’t have any “Before” photos since this was a brand new bathroom that didn’t exist before the renovation. But the “After” is still super exciting to me! When I first started on this bathroom project I presented my client with two options - “fun” tile on the floor with more neutral walls. OR wallpaper on the wall with a more neutral tile on the floor. I had gone to the tile store and took photos of 3 examples of the tile that I had in mind and was thrilled when they went along with the fun tile idea. This tile has such pretty blues and pale greens in it so for the wall color I selected a very pale blue that perfectly compliments the blue in the tile. It is SUPER subtle and looks great against the white trim. How cute is that light fixture over the mirror?! That was an etsy find! And I like how clean and modern the black and white selections look in the space. Christie Adams Design is a Bergen County NJ interior designer based in Wyckoff New Jersey. Available for one room transformations or whole house renovations / additions, Christie would be happy to chat about your project. The travel area is within 40 minutes of Wyckoff which includes towns such as Ridgewood, Glen Rock, Westwood, Montclair, and all of Bergen County. 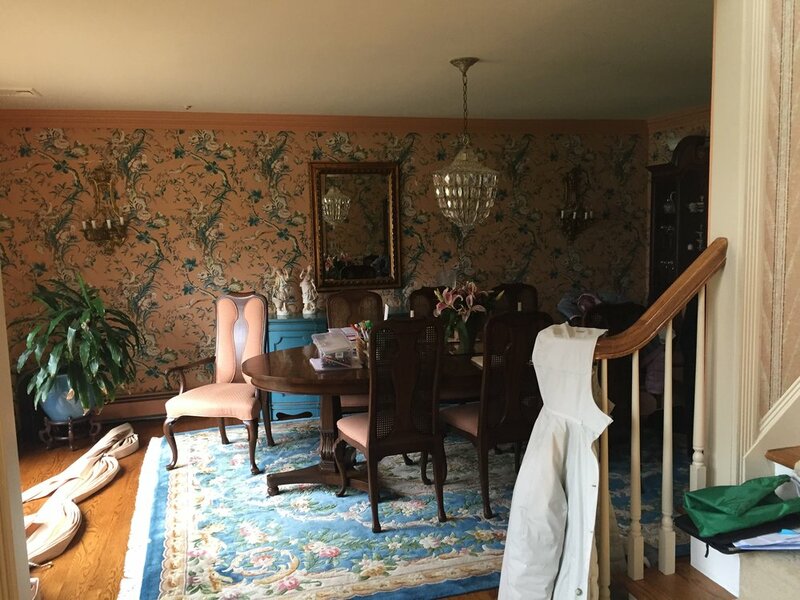 So first we had the wallpaper removed (although I must admit I thought the wallpaper had a very Anthropologie type of vibe going for it). Then we had wainscotting installed and the walls were painted a gorgeous blue/grey to contrast with the White Dove wainscotting. 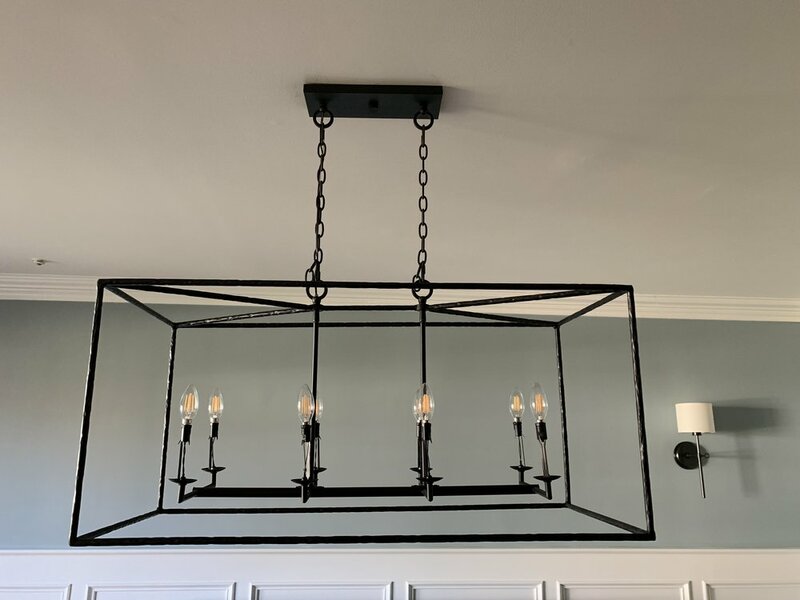 Next were the light fixtures - I paired a black chandelier with black sconces. I LOVE them both!! We are doing upholstered chairs for the 2 heads of the table and then black wooden chairs for the sides of the table. There will be a beautiful natural oak table coming soon so that I can share more of the room and a full reveal soon!! Christie Adams Design is a Bergen County based interior designer in the Wyckoff / Ridgewood / Glen Rock NJ area. Available for whole-house renovations or single room decorating and interior design services. The travel area is up to 45 minutes from Wyckoff NJ which includes all of Bergen County as well as towns such as Montclair, Westfield and Hoboken. If you are a builder or house flipper in the Northern NJ area contact us for design services to maximize your investment.